Dr. David Sanders, Founder and Executive Director of Kabbalah Experience is a teacher’s teacher. He combines over thirty years of experience as both a psychologist and Kabbalist helping guide people to deeper awareness and fulfillment in their lives. His own transformation from religious studies to mysticism intrigued him to broaden the study of Kabbalah to practical spiritual growth. He is now considered a Master of KE’s unique teachings – “Transformational Kabbalah” – which combine traditional mysticism, contemporary psychology and quantum physics. It is David’s joy to help others challenge their views of themselves and the world. Through study and practice David’s students regularly change their perceptions and choose to alter or modify their behavior – which in turn brings positive change to relationships, community, and expressing their purpose in the world. David maintains an active therapy practice, specializing in working with couples and families and is co-authoring a book on creating new families after divorce. He is the author of 2 books on mysticism and language, and is currently writing a book on MASKS, the subject of one of his most popular courses. David considers it his fortune to live with and learn from his wife Rita every day. With two sets of twins and an eldest son, life is rich for the whole family. Rabbi Benjamin (“Jamie”) Arnold has been a student of mysticism, Buddhism, meditation and Kabbalah and the teachings of Mussar for more than 25 years. 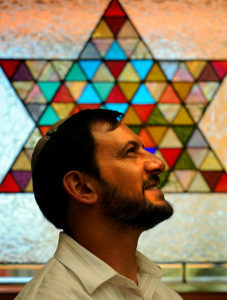 He has served as a congregational rabbi and teacher since 1997, and came to Congregation Beth Evergreen in Colorado as their first full-time rabbi in 2005. Originally from Western New York, he also served as Rabbi at Temple Sinai in Amherst, New York. Rabbi Jamie’s teaching draws on his experience as a spiritual practitioner, intensive learning with the Institute for Jewish Spirituality, talent as a musician and writer, and a deep-rooted commitment to fostering spiritual connections between us all. He is active in building bridges between communities as a member of the Evergreen Interfaith Group and past President of The Interfaith Alliance of Colorado. Rabbi Jamie is a graduate of Kenyon College (1992) and the Reconstructionist Rabbinical College (1999), a husband, a parent of three young adult children, and an avid skier and mountain biker. He brings a caring heart, consummate knowledge, spirituality and passion to every class he teaches at Kabbalah Experience. Melanie Gruenwald comes to the Kabbalah Experience with over 20 years in informal Jewish education. Engaged with senior citizens, families, college students, and teens, Melanie has extensive professional experience with communal leadership and community-organizing. She earned her B.S. in Psychology from Binghamton University (S.U.N.Y), and Masters in Social Work and Certificate in Jewish Communal Service from the Wurzweiler School of Social Work at Yeshiva University. Melanie has pursued additional Judaic and spiritual studies at the Pardes Institute of Jewish Studies, the Conservative Yeshiva, and most recently, Kabbalah Experience. Melanie is married to Rabbi Salomon Gruenwald, Associate Rabbi at the Hebrew Educational Alliance, and is mom to three children, Koby (z”l), Hannah, and Micah. Her passion for learning and understanding a broader worldview, has been further expanded at Kabbalah Experience, and she looks forward to serving both as a teacher and student in her classes.